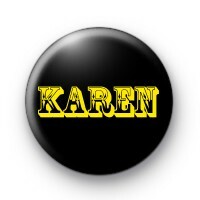 A black button badge with gold/yellow text which can be customised with names or text using the box below. Create as many badges as you need for your party or event. This is a luxe inspired luxury badge, ideal for you lovers of the luxury lifestyle & tumblr lovers. A super smart button badge. Standard 25mm badge hand made in our UK workshop.